We discovered Copenhagen based artist Jasper Sebastian Sturup at the NYC Art Book Fair at PS1 MoMA on smouldery post-summer evening. His handmade art books grabbed at our hearts - line drawings on brown and colored papers, of hair and animals, bodies and crystals, with names like Black Country Rock and God Damned The Sun, tied together with colored thread. I mean, how could one not fall in love?? His newest body of work runs across large stretches of pink satin, with a certain psychedelic melancholy that permeates Jasper's visual language. Unable to abstain from including some of our favorite images with new images from his current exhibition. We don't think you'll mind. When did you suspect you might be an artist? As a kid. Not just because I spend a healthy part of my time in school, drawing in class. My mom would take me to see exhibitions and I would somehow connect with seeing and making art, I understood the language, often I would spend a lot of time copying what I had seen when I came home. I think by the time I was in 7 or 8 grade I would say that I was going to be an artist, I didn’t lack a great dose of confidence back then. What has it been like growing up an artist? I think I had a common suburban childhood, not feeling at home there, wanting music and art. One of those places where you can either do sports or hang out with reggae pot smoking kids, I don’t like reggae! I spend a lot of time dreaming myself to other places wile drawing and listening to Bowie, the Cure and Depeche Mode. It was truly amazing when I, as 17, moved to Copenhagen in 1987, I ended up in a place where everyone said they were an artist, a poet or musician, it didn’t matter if you had written anything, if you said you were a poet you were a poet, total freedom and that what I wanted most was valued. It still took some years figuring things out before I was accepted to the Academy, but I had defined myself as an artist. Over time there has been a lot of different influences, I am one of those who soaks everything up and can’t get enough. A neighbor of mine as a kid, would take his bike and ride into the forest to paint, he had sculptures around his house of his family, I think that showed me that there was a way to live with art. In the beginning I was very much into pop art, as 16 in 1986 I went to Keith Haring’s Pop Shop in New York, where he sold a lot of different merchandise with his drawings, he said something like it was important that his work was accessible to those who cold not afford a painting, I took that to heart, and it was one of the reasons besides loving books that I started making my artists’ books, that I still make and keep cheep enough so that if you like them you don’t have think about buying them. I still have some things from the shop including the Inflatable baby. In the beginning of the 90’s when I was at the Art Academy in Copenhagen I got heavily into the likes of Martin Kippenberger and Anselm Kiefer, and other artists where the artist was not afraid of being bold, expressing themselves and not afraid of having skills. I was for the longest time the only one drawing at the academy, so it was a great relief when the wave of drawing arrived in the late 90’s with Maczel Dzama as one of my favorites. For drawing I had been looking at David Hockney since I was a kid, there was a couple of his drawings at the Louisiana Museum, I still find him to be one of the most amazing artists, the way he reduces the world into line is in a class of its own. 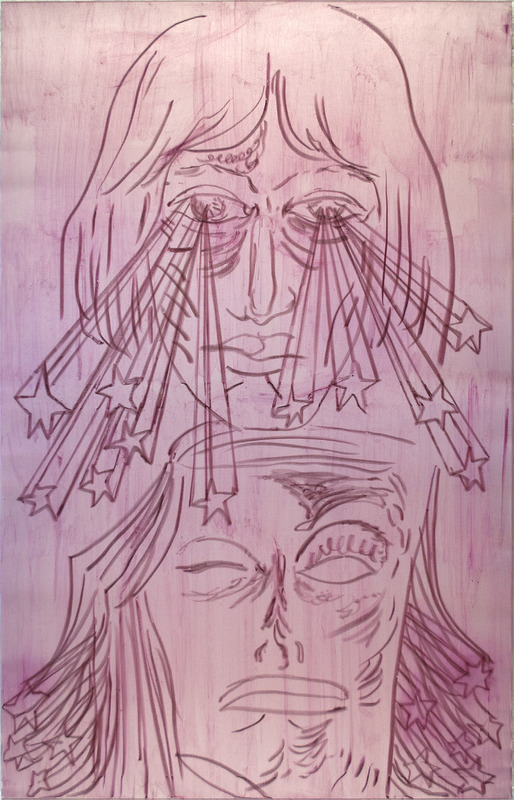 The last years I have been looking a lot at Francesco Clemente and Mimmo Paladino, in different ways they are working with the grand poetic, the bold, and the intimate at the same time, that I find very inspiring. I had my second visit to the Uffizi not long ago, the ultimate collection of renaissance painters, when you drive through the Italian summer landscape passing the same flowers that you see in Botticelis paintings it does not get much better. What're you listening to on repeat? There is an awful lot of David Bowie in my life. From the moment I got Let’s Dance for my 14th birthday I was hooked, since then not many days have been without listening to his records, I have been lucky enough to see him live seven times. I have thought a lot about how he approached his work when thinking about how to do my own, not straying away from complexity and sticking with the first touch from the pen or now oil stick. I have periods of listening heavily to something and then going onto something new. But some records are stuck with me always like Suede’s first 3 albums poetic and raw, the last 3 records by Talk Talk, they are so beautiful and meditative. Recently I have gotten back into David Sylvian who is somehow in the family of Talk Talk. Not long ago my mom gave me her record collection, full of great 60’s and 70’s record, besides the stuff like Santana, Pink Floyd and Janice Joplin there was some Danish prog rock, I listen a lot to one record called Gibbon Jump by Bazaar from 1980 it’s Jazz/Folk/Middle eastern/Psychedelic, from my studio window I can see Christiania behind the trees, to me this is the sound of going there as a kid with my mom, I can almost smell the incense and weed, and see the kids on a horse in the little field. There is The soundtrack to Death In Venice, that starts with the most amazing long slow Gustav Mahler Symphony no 5, that is one song I can listen to endlessly on repeat just like Bryan Ferry song Boys and Girls from the great album of the same name. How is painting on silk? I really like it. I have done a couple on silk some time ago, the new ones are satin, but they react the same and it's great to work on, as long as one is careful, it tears really easy, so I stretch it over another fabric before working on it. It soaks up the thin acrylic paint really nicely, giving a somewhat transparent look, so when I start with the oil besides being on top it looks like there is an added depth compared to working on canvas, at the end I draw with the oil stick that again is on top of it all creating a great effect. I like the smoothness of the satin, it is such a fine weave, the oil stick just gliders over it, leaving a much finer patten than I would get on canvas. And then off course there is the shine, I love it, the way it reflects the light. I think that is difficult to answer, that word have been used and misused by so many to say so many different things that I don’t know what it means anymore. So maybe a better answer is that I believe all should have the same opportunities and should be treated equally, with no regards to gender or race. How is that for hippie at heart answer?